A romance that began at a party in London has led to the announcement to-day of the engagement between Mr. Peter Alexander Grey Wilson, now at Clare College, Cambridge, and Miss Jacqueline Nancy White, of Rushden. Miss White is the younger daughter of Mr. and Mrs. John White, of “Ferrers Mere,” Rushden, and her fiancé is the only son of Lt.-Col. Denis Grey Wilson (late of the Indian Political Department) and Mrs. Wilson, of Comrie, Perthshire. The announcement will give much pleasure to all who are associated with the business of John White, Ltd., boot manufacturers, and it is of interest that Miss White and Mr. Wilson were both present at a social gathering at the Higham Ferrers premises a few weeks ago. Miss White was born in Rushden and educated at Roedean, Wycombe Abbey and Blunt House, Oxted, Surrey, leading to the Universities of Lausanne and Fribourg, where the last two years have been spent. Mr. Wilson spent some years in India as a child, his father being Resident at Nowgang, Baroda and Gawlior. After education at Haileybury he went on to Clare College, Cambridge, but his studies were interrupted by the war, in which he was an officer of the Argyle and Sutherland Highlanders, serving on the Continent. He is at present studying Economics at Clare College, and his social interests include sport. It was at Blunt House that Miss White became a friend of Mr. Wilson’s sister, Miss Denise Grey Wilson, and the friendship led to the meeting with Mr. Wilson at a party last year. 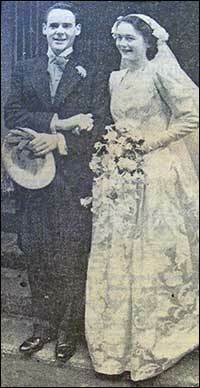 By a happy coincidence the announcement of Miss Wilson’s engagement to Lt. John Crowley, R.N., is also being made to-day. Miss White was at home yesterday and devoted part of her time to exercising Jeremy, the huge bull mastiff which is a familiar figure at “Ferrers Mere” and in the show rings. She told us that the date of the wedding has not yet been arranged. Many Northamptonshire people were in London on Tuesday for the wedding of Miss Jacqueline White, of Rushden, and many more had the ceremony in their thoughts. 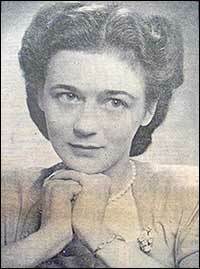 As the second daughter of Mr. and Mrs. John White, of “Ferrers Mere,” Rushden, the bride is well-known in the county and popular with the employees of John White, Ltd. She was born in Rushden and educated at Roedean, Wycombe Abbey and Blunt House, Oxford, finishing at the Universities of Lausanne and Fribourg. The bridegroom was Mr. Peter Alexander Grey Wilson, only son of Lt.-Col Denis Grey Wilson and Mrs. Wilson, of Comrie, Perthshire. He spent some early years in India, where his father was Resident at Nowgang, Baroda and Gwalior, but was educated at Haileybury and Clare College, Cambridge, returning to the college for the study of economics after serving on the Continent as an officer of the Argyle and Sutherland Highlanders. Escorted through the broad aisle of St. George’s Hanover Square, by her father, the bride wore a full skirted frock of white French satin broche, and her veil of white tulle, held in place by two clusters of gardenias and stephanotis, was very full and flowing. She held a spray of gardenias and stephanotis, and a triple row of pearls was worn. Attending the bride were the Misses Anne Alexander (London), Dorothy Hartley (Chester), Margaret Moore (Bucklers Hard, Hampshire), and Alison Hall (Harlton, Cambs.). Miss Alexander, who has spent some years in the West Indies, is a cousin of the bridegroom, and the other bridesmaids are friends of the bride. Miss Hall being the daughter of the Rt. Hon. William Glenvil Hall, M.P., Financial Secretary to the Treasury. All had picture frocks of ice-blue chiffon, full-skirted and long-sleeved. Small chiffon caps matched the dresses and were clustered with pink flowers. Sprays of mixed pink flowers were carried. The bride’s mother was dressed in grey silk, with pink gloves and grey accessories, and wore a hat of grey and pink tulle with grey ospreys. A navy blue attire was chosen by the bridegroom’s mother. 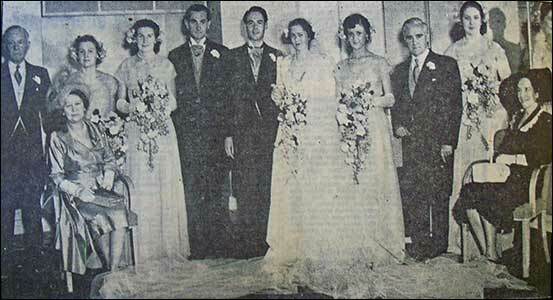 Mr. Lee Harragin, son of Sir Walter Harragin, K.C., and Lady Harragin, was best man. Sprays of mixed flowers had been used for the decoration of the church, which was filled with members and friends of the two families. The Rev. Enwin A. Green, Rector of Rushden, conducted the service and was assisted by the Archdeacon of Middlesex, the Ved. The Hon. J. H. Phillimore, who gave an address during which soft music was played. “All people that on earth do dwell” was sung as the bridal procession entered, and Psalm 121 followed a prayer for the blessing of the ring. After the second hymn, “O Perfect Love,” the choir sang “God be in my head” (Walford Davies), and during the signing of the registers, “The Heavens Are Telling,” the chorus from Haydn’s “Creation” was sung. All the choral music had been chosen by the bride. Mr. Morris, organist of St. George’s, played for the service but at the close his place at the console was taken by Dr. Charles E. Jolley, the veteran organist emeritus, whose offer to play Mendelssohn’s “Wedding March” had been accepted with pleasure. Dr. Jolly was born at Higham Ferrers, being the son of a former Mayor of the town, and because of his old associations with the Rushden district felt he would like to take some parting the ceremony. After the bridal party had left, 200 guests drove to the Savoy Hotel, where the reception had been arranged in a room overlooking the Thames. The company included General Sir Roger Wilson, K.C.B., C.B.,D.,S.O., M.C., and Lady Wilson (uncle and aunt of the bridegroom), the Rt. Hon. Glenvil Hall, M.P., Mr, Frank Salisbury, R.A., and Professor A. E. Richardson, R.A.
With the guests circled around her, the bride cut the cake in ceremonial style, and a toast was given at the call of Professor Richardson, who made a witty speech. When the departure of the bride and groom was announced, the relatives and guest’s assembled in the entrance hall and on the staircase and landing to give the couple an enthusiastic send-off and shower them with rose petals. A crowd outside watched with interest as Mr. and Mrs. Wilson drove off for the honeymoon, details of which they had kept secret. The bride had changed into a navy and white check two-piece with cherry red hat, shoes and crocodile bag. After an extended holiday, Mr. and Mrs. Wilson are to reside at the Old Rectory, Yardley Hastings, a house which is their wedding present from Mr. and Mrs. White. It was built in 1701 and is a choice example of the architecture of the late William and Mary period. Among the many other gifts are a silver tea service and tray from the staff and employees of John White, Ltd., and Mr. White’s personal gift to the bridegroom is a Sunbeam-Talbot car.